I am one of 28 team members that are here in Nepal. Each person has a role that is pivotal to our overall success. Each has a story to tell – about how they became involved and why they are here. Over the past couple of days, I’ve asked a few of the team about their experiences. Dr Geoff Paul (Obstetrician/Gynaecologist) has been volunteering in Nepal over the past four years. Geoff continues to be inspired by the team camaraderie and fact that we achieve good outcomes for the Nepalese women who would otherwise continue to suffer from this debilitating condition. This year Dr Geoff initially conducted assessments with the Nepalese nurses informally teaching and helping them correctly assess which women require surgery. In the past couple of days he has scrubbed in with the surgery team. Louella Cooper and Esther Tween are Theatre nurses, Working alongside our Nepali colleagues, they are responsible for the smooth functioning of the operating theatre, for the equipment and instrumentation used in the operations. 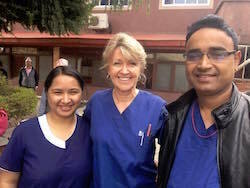 Both are first-timers in Nepal and to Open Heart International. Louella heard about OHI some years ago when she used to work at Sydney Adventist Hospital. She nows lives in Queensland, and it was through a work colleague that who encouraged her to consider volunteering with the team. Louella has found the experience rewarding and the cultural experience interesting. The volunteer team cohesiveness and involvement of the Nepalese staff has been a highlight. Esther works at Sydney Adventist Hospital so has heard lots about OHI for many years. Now her children are older she felt it was the right time and opportunity to volunteer. Her first impression of Banepa was filled with mingled with sadness and overwhelming sense of privilege. Sadness because of the poverty, dust and pollution and the sheer hard-life lived by the people here and privilege to be part of such a team and a reflection of life lived back at home in Australia. One of her highlights so far has been the many smiles and happy faces of the women post-surgery, and being part of a like-minded bunch of team members. Outside of the operating theatre, the ward is just as busy as some of the Nepalese women prepare to go home after surgery. Some women have travelled for four days to seek the health care needed. They have come from far away districts such as Doti in the north-west and Khotang in the north-east of Nepal. 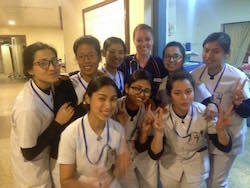 Our team have meticulously cared for the patients alongside the Nepalese staff. 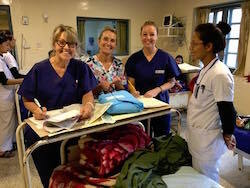 Karen Vaux has been volunteering in Nepal for the past 10 years and leads the Ward team, together with the hospital’s Nursing Unit Manager Suni Pradhan. Together with their teams they work to care for patients’ pre- and post- surgery and discharges. The turnover in the ward is fast-paced where on average there are up to 20 patients. The ward nurses prepare theatre lists, care for the patients by checking their vital signs, ensuring they are stable, support with pain relief and provide necessary antibiotics to ward off any infections. I asked her what keeps her coming back year after year. She says it’s because the women are so grateful, thankful, give warm hugs, and she feel so blessed to be part of a team who provide such care for women who otherwise go untreated. Amanda McCamey is here for the first time. I ask her few questions such as first impressions and why she chose to do such volunteer work? 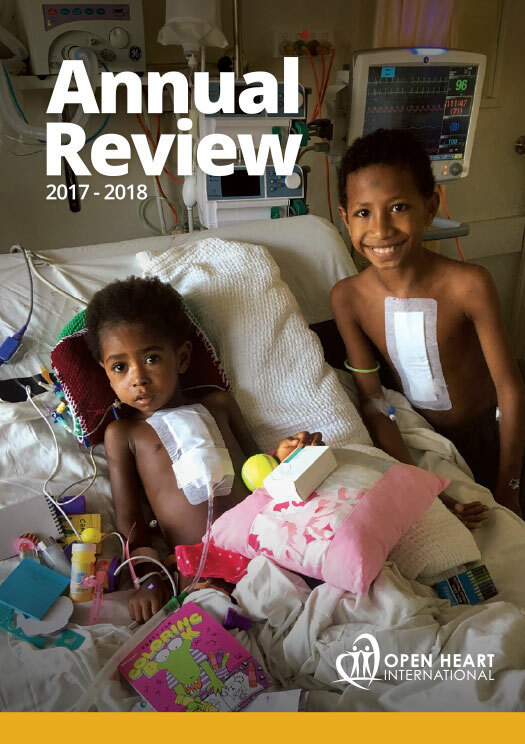 Amanda’s first impression of Nepal was of the chaotic traffic and congestion…now nine days into the project visit she loves the chaos, the women she meets in the hospital, using her skills and learning in a new environment. She has been impressed by the resourcefulness of the hospital where nothing gets wasted like back at home.